Custom badger sports shirts are the popular brand among ball teams and business. They offer a variety of colors and styles and all of 100% poly performance material. 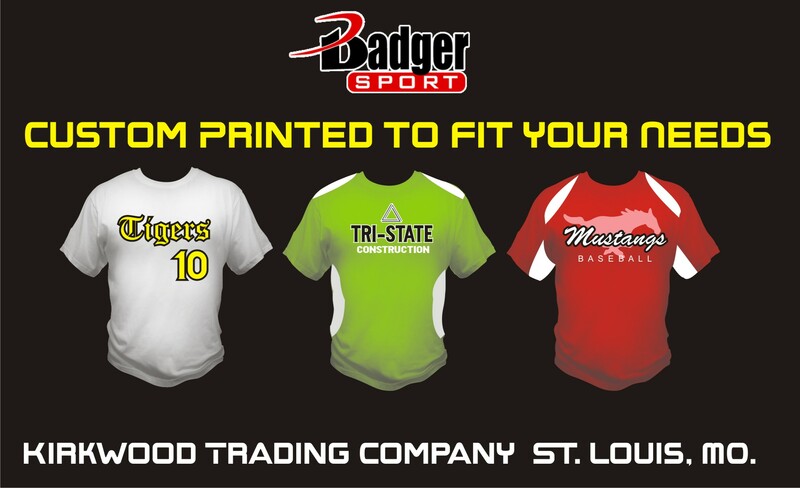 Kirkwood Trading Company can customize these Badger Brand shirts to fit your needs whether it’s a baseball team using them for jerseys or a business that likes to have a sharp look on casual day. With our convenient location, excellent customer service and superior screen printing, nobody will have you looking better than us. Custom badger sports shirts come in many different colors including safety green and safety orange. In addition they offer women’s styles with matching colors. Truly a brand among brands and not only are their shirts slick and smooth and light weight, they are also among the most durable performance shirts on the market. As the market for performance shirts grows you get a lot of companies introducing new styles and unfortunately many of these styles are inferior. They get runs quickly, their dye runs, and over all they just aren’t a quality garment. Custom badger sports shirts are among the best when it comes to durability. Their price point is the middle of the road which makes them a convenient option for little league teams or college practice jerseys and everything in between. The most popular Badger style is the 4120. It’s their lightweight 100% performance poly that comes in about 20 different colors including camo. They offer all your basic colors such as black, white, navy, Royal, red, kelly, grey, and gold. They also offer the safety colors, some cool shades of blue and pink and the camo is always a popular color. And we will be happy to price custom badger sports shirts for you!